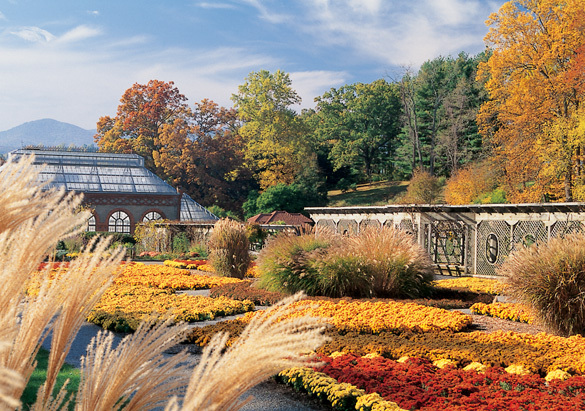 The gardens and grounds of Biltmore during fall are nothing short of dramatically beautiful. An autumnal palette begins just inside the Lodge Gate and continues around every turn. But where exactly are the best places on the estate to find views of spectacular fall color? Found at the top of the Esplanade near the statue of Diana is a “signature shot” of Biltmore House, framed by enormous hemlocks, pines, and rhododendron, with a majestic view of the Blue Ridge Mountains in the background. The wide open terrace on the south end of Biltmore House offers long-range views of the Blue Ridge Mountains with dramatic fall color. The Rooftop Tour of Biltmore House provides you with a bird’s eye view after a climb up the Observatory’s spiral staircase and onto the balconies and rooftop of America’s Largest Home®. The fall color continues as this formal garden is transformed with hundreds of vibrant mums in autumnal shades—this year, boasting brilliant blooms of red, purple, orange, and yellow. Follow the Azalea Garden path to the Bass Pond path and discover vivid leaves reflecting upon the water. The geese and other birds and wildlife around the water also add excitement to the season. Any spot near the Lagoon offers dramatic fall color from the wide variety of hardwoods that surround it, but the Boat Ramp towards the middle provides particularly vibrant hues with a view of the west façade of Biltmore House in the distance. Set upon a hilltop near Antler Hill Village, The Inn’s grand panoramic views are not to be missed. Relax on the Grand Terrace and enjoy a glass of Biltmore Wine as you take it all in. Lastly, Biltmore’s more than 22 miles of trails offer spectacular views throughout each season, but fall provides full immersion of color as your stroll through the beautiful woodlands of the estate. Don't miss these special must-see estate locations to experience fall color at its absolute finest. Plan your visit today!